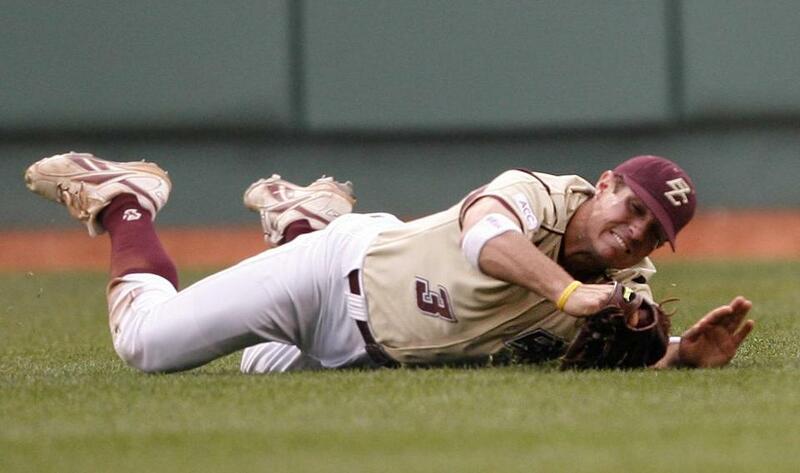 Boston College’s Pete Frates held up his glove after making a diving catch at Fenway Park in 2006. It’s summer, so naturally people all over New England are trying to find ways in which to cool off. But that’s not why videos of Bostonians and others across the country dumping buckets of ice over their heads are filling social media feeds. What is now known as the “Ice Bucket Challenge” has become viral online — a dare designed to raise awareness and money for charity. This particular challenge started locally earlier this summer in support of 29-year-old Pete Frates, a former Boston College baseball captain diagnosed with Amyotrophic lateral sclerosis (ALS), otherwise known as Lou Gehrig’s disease, in March of 2012. A person who accepts the challenge is videotaped explaining what it’s all about before being doused in icey cold water. That person must also nominate others through social media channels to take on the challenge within 24 hours. If those called upon fail, they are asked to donate $100 to charity. Notable Bostonians haven’t shied away from joining in — even Mayor Marty Walsh and Councilor at Large Michael F. Flaherty filmed themselves in the act. Boston athletes have gotten in the mix, too, like Bruins’ left winger Milan Lucic. And Patriots’ wide receiver Julian Edelman, who nominated a few of his teammates, including Tom Brady. Jason Varitek, of Red Sox fame, and his wife, Catherine, got on board as well. Some local members of the media are also taking part, including WCVB’s Erika Tarantal and Olessa Stepanova and Jenny Johnson with Boston.com. 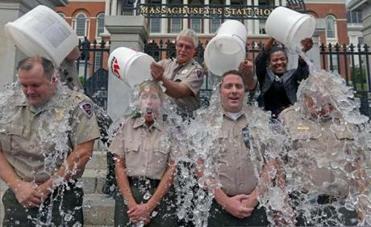 A city-wide challenge was organized by Boston.com today on the Copley Square lawn, where they provided buckets, ice, and water to participants. So who did they challenge? New York, Chicago, and Los Angeles. The dare has been dealt.